Within days, Apple will release the first public beta of macOS High Sierra, the desktop operating system slated for a fall debut. 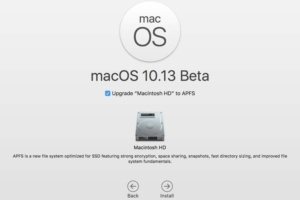 The beta will let anyone with a Mac -- including workers with their BYOD MacBook Airs and MacBook Pros, and IT admins responsible for supporting Apple's OS -- try out the upgrade, test application compatibility and explore its new features and functionality. If the past is any predictor, as many as 3 million Mac owners worldwide -- the number estimated to have downloaded and installed last year's public beta of macOS Sierra -- will give High Sierra a go before Apple taps it as done. But Apple runs its public beta program a lot differently than does Microsoft, the enterprise king. We have the proof: Questions about everything from release cadence to support. With answers, naturally. What is a public beta? It's a preview of an upcoming operating system, in this case macOS High Sierra, available to any Mac owner. Access is what separates the public beta from its predecessor, the developer-only beta Apple debuted June 5 at its Worldwide Developers Conference (WWDC). That version was available only to registered developers, who pay $99 annually to download previews, utilize Apple's APIs and submit products to the company's App Store and Mac App Store. Has Apple issued a public beta for macOS High Sierra yet? No. But expect it to arrive shortly. Apple released a public beta of its latest mobile operating system, iOS 11, on Monday, a clue that one for High Sierra is imminent. (In the past, Apple has pushed out iOS and macOS betas on the same day.) Earlier in the month, the company said it would take High Sierra's preview public by the end of the month, which is Friday. How do I get in on the public beta? Sign up with an Apple ID, the username and password combination that authenticates access to iCloud, the company's sync-and-storage service. Apple's public beta program is free, and a single registration gives access to both iOS and macOS previews. After registering, each Mac must be "enrolled" in the public beta by downloading and installing a small utility, available from this website. A similar download must be retrieved and installed on an iOS device, such as an iPad Pro or iPhone, to enroll it in the beta. Apple followed with the first iOS public beta in 2015 when it previewed iOS 9. Is there a way to configure a number of Macs for the public beta? Simple answer: No. Unlike, say, Windows Insider, Microsoft's public preview program, there's no way for an IT administrator to set multiple Macs so that they can access, download, install and run the High Sierra preview. Each Mac user must enroll their device(s) using their own Apple ID. An admin's best bet would be to craft an email that points employees to the appropriate URLs, such as the registration page and enrollment page. How many High Sierra public betas will Apple issue? Figure on six. In the past three years, Apple released seven (Sierra, 2016), six (El Capitan, 2015) and six (Yosemite, 2014) public betas, with a new version appearing, on average, every two weeks. What about support? Where do I go for that? You're on your own. Apple doesn't offer support, not even a dedicated user-to-user discussion support group where queries to more experienced hands can be made. Compared to Microsoft, which regularly publishes posts to its Insider blog and hosts multiple Insider-specific discussion groups, Apple runs a bare bones beta. How do I get off the beta train? It's pretty easy. On a Mac, pick "System Preferences" from the Apple menu, then click the "App Store" icon. Click the "Change" button next to the line "Your computer is set to receive beta software updates," then confirm by choosing "Do Not Show Beta Software Updates" in the ensuing dialog. When High Sierra releases this fall, you can install it from the Mac App Store without having to revert to the version that ran the Mac before the public beta was applied. I'd like to dump the beta and return to Sierra [or whatever was on the Mac before]. How do I do that? Follow the instructions here, which assumes you made a backup of the Mac or iOS device before jumping into the public beta. Anything I need to do before jumping on the beta? Back up your Mac or iOS device. Running beta without a backup in the bag is like driving without a seat belt. And no airbags. In a car without headlights. At night. In the rain. Back up the Mac using the already-on-the-system's Time Machine application. If you've never backed up a Mac, this support document spells it out.